If the black and white of horse control is the stick and the carrot, and the grey areas are everything in between - is there a different dimension in colour? 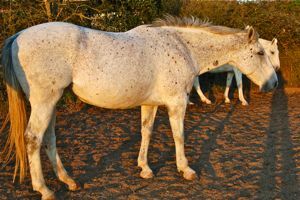 The concept of controlling a horse is as old as whenever humans realised they could benefit more from exploiting a horse's strength than they could from eating their flesh and using their hide. We can't know for sure how this first interaction came about. It might have been a chance event which was born out of compassion and led to a mutually beneficial relationship. The story depicted in the book The Valley Of Horses by Joan Auel where the main character Ayla rescued a foal whose mother she had killed is such an scenario. In this story the concept of horse control was irrelevant because the strength of the trust bond between the two was a given. Sadly this story describes a scenario which is rare, and most people control horses in a very different way, either directly using pain or indirectly using fear of pain, which comes to the same thing in the end. This is the way we are taught to ride and handle horses. When we first get on a horse we are instructed to use our leg aids, in a more or less sophisticated manner, until the horse responds. If they don't respond then we use the whip in the same way. It should be done in a rising scale of intensity until the horse responds. If it is done consistently in this way, the horse will become more sensitive to the lighter aids and our training is a success. Why complain about this form of horse control when it works, and is the most obvious and convenient way to communicate with an animal much larger and stronger than ourselves? Of course this particular example is only a sample of the whole picture. 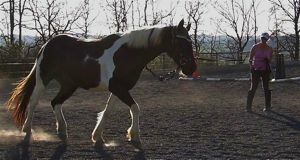 Similar communication with the seat and the reins - basically any physical contact between the horse and rider - must be figured out to form the communication we use as horse control when riding or handling them. It could be said that it is the manner in which it is carried out that is the key, and this is absolutely true. 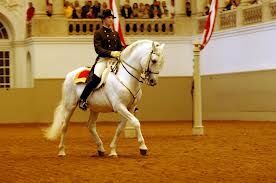 Some riders can ride their horse with such sympathy and physical sophistication that their aids become a pleasure not a pain for their horse, and it is our responsibility to seek and improve this ability within ourselves. What has recently been of interest to us, however, is what happens when the horse simply does not respond at some point in the rising scale of demand. 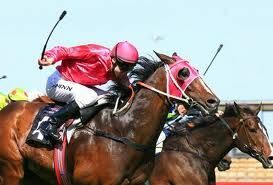 We have seen enough ignorant bullying of such horses to know that raising the stakes higher and higher is not always an ethical option. Is there another way of looking at this horse control question? Certainly working with horses who say 'no' like this is the best way to learn to have a wider perspective on horse control, and see what else might be going on that we could understand and employ. This is a similar principle to geneticists studying both mutant and normal forms of a gene, and understanding the true nature of the gene from the comparison. Experiences with two horses over the last year has begun to fill in a bigger picture, or maybe hint at the existence of a bigger picture would be more honest! At times it has involved letting go of conventional wisdom completely and following intuition only. There was no agenda other than trying to find a way we could work together in harmony. Both of these mares (left) are by the same sire, an American Thoroughbred, Captain Maverick, and there does seem to be a link to odd, autistic-like behaviour in some of his progeny. 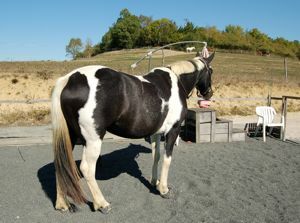 We have four of his offspring at HHT, and the two geldings are, on balance, a bit more straightforward than the mares. Mares of course tend to be trickier than geldings anyway, so there were to be no short cuts with these two - horse control had to take on a new meaning. 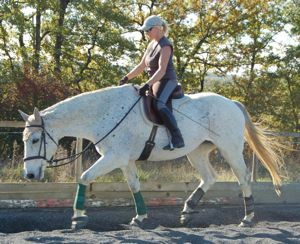 Amy took a long time to accept everything about being prepared for riding, and being ridden itself was a big challenge for her. Having always spent much of her time day dreaming, and when asked to do something reacting more and more violently if the request was sustained, she could not be described as 'normal' psychologically. 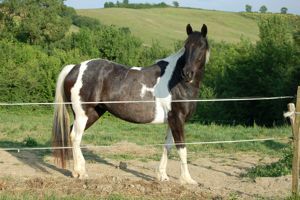 She is therefore a perfect project for learning more about what we can expect and receive from horses. Traditional horse control worked about as well as traditional teaching would with a seriously dyslexic child. After much patience and steps backward we had reached a point in her training where she was hacking out quite happily and working quite well in the arena. She still needed careful support of her balance by the rider's posture, otherwise she would lose confidence and react in some semi-violent way, such as half rears or spins. During the process of continuing her straightening training, her spinal scoliosis released at a major compensation point. This meant she was moving in a much more supple and consistent way, because the compensation had been keeping her back stiff. The difficult part was that without this compensation to hold her together physically, underlying problems in her neck and shoulders surfaced and were causing her discomfort or pain. She was unlevel in trot and her tolerance levels took a nose dive again. I stopped working her for a few months and gave her Craniosacral Therapy to unwind the neck and shoulder issues. It took a longer time than I anticipated for her to become sound again, but with hindsight I could see that her whole body had to reconstruct after such a major change, so it wasn't really surprising. When I started to work her again on the lunge, she decided that she didn't want to be ridden. She communicated this by not wanting to come up to the mounting block, and when she finally did and I got on, she felt unsafe and at the slightest touch of the leg she threatened to go up on her back legs. 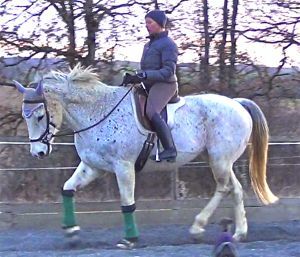 Being a believer in 'a happy horse is a safe horse', it was pretty obvious that she wasn't happy and as she had accepted to be ridden previously, it seemed obvious that for whatever reason she just wasn't ready yet physically. The line between mind and body maybe doesn't exist as we imagine, however, and with hindsight I would say that maybe she wasn't ready mentally to be ridden again either. During the work we had done up to this point, most of the time she was semi-dissociated or fully dissociated (see: Horse Trauma). I think of it as a little bit like someone who finds it difficult to be 'in their body'. Working with her is a way of showing her that her body can feel good, but this is only possible if it does feel good, otherwise she would disappear again into her day dreams. This is why forcing her to do anything for the sake of training progress or conventional horse control would have been entirely counter-productive. The only 'success' in her case was to bring her mind into the present. I do believe that her work up until this point was very valuable, even if she was not fully present for much of it, because it was part of her process of accepting the world. She was not forced, so she was not being traumatised, and the straightening work in engagement was fundamental in strengthening her up enough to be able to let go of the physical compensation in her spine. So I stopped thinking about riding and continued on the lunge until she was balancing better than ever and enjoying what she was doing. Each session her personality came out more and it was fun to be with her. She was able to cope with the feeling of having her boundaries 'supported' i.e. I could maintain my position as leader in the work, rather than backing off, and she was comfortable with that. It felt like each day she was able to see the world a bit more clearly because she was willing to look at it now. 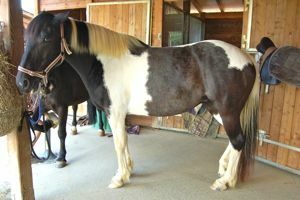 The transformation was on one hand radical, as if she was changing who she was, and on the other hand it would undoubtedly be invisible within the criteria of conventional horse control. Within the security of our latest trust development, I started to bring her up to the mounting block to see how she reacted. It was an important part of the process that I let go of any feeling of pressure or expectancy, which our deeply ingrained concept of horse control creates in us. One day when I managed to do this completely for the first time, she came up to the block and I asked her if I could get on and her reply of 'no' was so clear and so calm, I didn't need to do anything further but give her a treat and take her back to her friends. The funny thing was that the communication with her was so enjoyable that I felt a buzz from it all day. I still do now. It was like speaking to a being from another planet, not because she is one (necessarily!) but because we were truly communicating with each other, and that intelligence was awe-inspiring. This was indeed a completely new dimension of horse control. 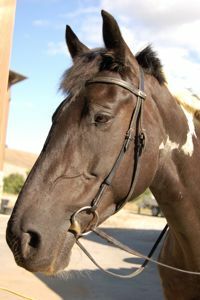 After that experience the idea of horse control was transforming into horse communication. When you communicate with another being, not only do both of you have to be 'present', it also means that you both reach an agreement, so you have to be prepared to trust each other. These things have been said a million times before of course, but how often do we actually do it - put ourselves undefended into the care of our horse? We can only know in our own heart what the truth is. Amy needed me to trust her because of her own vulnerability, whether it was because of her wish to protect her spine, or because psychologically she couldn't cope with feeling out of her own control. My faith in her choice about what she could cope with gradually melted her defenses and after about ten times of saying no, she finally had enough resources to say 'maybe'. Then I began to sit on her and think about re-introducing the aids. It was an interesting experience to slow down the whole process, which most of us take for granted, to such an extent. Amy took nothing for granted, so neither could I. 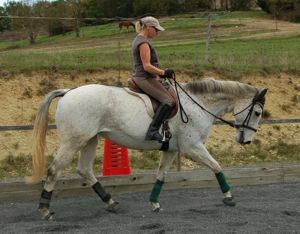 One thing I learned was that slowing everything down so much allows the horse to integrate the experience more easily. This will depend on the aptitude of the individual horse, but I would guess we take things too fast for most horses. When I first thought about moving off from the mounting block and used the gentlest leg aiding I could manage, she responded by tightening her whole body. If I persisted she threatened to go up. It was interesting to sense her mental choice before her physical response. There was a kind of gap, like when a computer is connecting to something, when she was making her choice. As time went on this gap seemed to become less charged with energy, as if she was calmer and more able to listen. One day it so happened that the gate was open and I asked her to walk up the road instead. Even going towards her friends was not a given, but the extra incentive helped her to make the leap of faith, and after some hesitation she went. It sounds a bit ridiculous, but that ride up the road felt marvellous. She felt so sensitive and alive to ride. After that the link between her choice and her body responding was there, and bit by bit we reformed our vocabulary. At first she wanted to stretch her neck right down and only go on one rein. I didn't challenge how or where she wanted to go directly, but instead allowed the circumstances to melt away her limits. For example we might find ourselves changing the rein because of where we ended up in the arena, so she found that the other rein was okay. Physically, the more she adjusted to carrying a rider on her new body, the less she felt she had to protect it, and I could move closer to channelling and engaging her. It is a fine line, because ultimately dressage is horse control. I still had an agenda other than just sitting on her back. I knew that it could be a feeling for her which was as empowering and supporting as no other, but the choice still had to be hers. It's a bit like if you have a personal trainer and they push you to your limits, you choose to trust them and do it. If they pushed too far, however, you might re-think that choice. If they were a sensitive and intelligent trainer, they would know to build up your ability as well as your trust in them over time, until the day they might ask you to exceed what you thought you could do, and you could push beyond your old limits and make new ones. Xas was born with Neonatal Maladjustment Syndrome (see her story) and because we were instrumental in saving her life, she imprinted onto people to a greater extent than a normal foal. In her case, this made horse control less of an issue in some ways, and more so in others. Her greater understanding of human wishes made handling her and riding her easier, as long as it didn't challenge her nature or her physical aptitude in some way. Throughout her training she has always had low tolerance levels and a short attention span, and carefully staying within her comfort zone has helped her to strengthen up enough physically that her attention span has improved greatly. She is still quite shuttered-off against the rider however and the usual methods of horse control, increasing the aiding and raising my vibration only worsened the resistance in her. 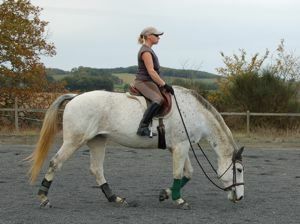 I had found the best way of keeping her 'on side' was to regularly go between lungeing and riding. Doing what I think of as 'friendly' work with the lunge whip, using it as more of an energetic tool to stimulate the different areas of her body helped her a lot. It was a bit like a form of accupressure. It has always been obvious how her 'shuttering' was a response to the rider on her back rather than someone on the ground. Why this should be never made much sense until a recent schooling session. The usual schooling session with Xas starts with twenty minutes or so of staying very gentle with her and melting a way through her 'barrier'. She has plenty of physical weaknesses which could account for her reticence. 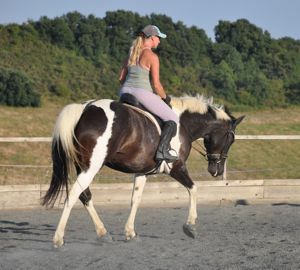 Both her feet and a vertebra in her neck have a genetic malformation, and I had assumed this was the reason she takes such a long time to respond to the rider. This particular day, however, she didn't seem to be coming round, in fact she became more awkward and impassive - shutting me out. When the physical loosening came it only seemed to fuel her antagonism, and she was difficult to balance and collect. It was exasperating and I felt like I was a barnacle on the side of a whale. The connection just wouldn't come. When a dead end like this appears it is often a chance to move on to a higher level, if the key can be found. Listening to my intuition told me that I had listen to her, but when I tuned into her it was impossible to feel anything. She was locked away. The idea then came to me that I had to feel from my heart. This may sound whimsical, but in fact the magnetic field of the heart is much larger and more influential than that of the brain. In all my experience of therapeutic work, the way we feel about things - the emotion we attach to them - is the root of all of our bodily complaints. If you listen to your heart then everything can heal. I concentrated on reaching Xas through my heart, and I had a clear vision of her, like a person shut away in the back of a room. As I was seeing this I felt her physical defenses begin to shift. She felt vulnerable, and I focused on being supportive and gentle with my aids. I understood that the reason for her 'shuttering' was that her perspective on the world was one of detachment and inability to reach others in a normal way. In people this is a well-known characteristic of Autism. The key therefore, was to accept who she was, thus allowing her more freedom to change. It seemed like the sympathy I felt for her being trapped in that way, was able to influence her in a way which was light years ahead of traditional horse control techniques. After a few minutes she seemed to 'come to the door and look out', but it was the physical changes which accompanied this which were most remarkable. Her sides softened to an extent they rarely had before, allowing my leg in, her neck became loose and sensitive, and she allowed me to balance her with my posture. Interestingly she still reacted in certain little insensitive ways, like pushing slightly against the bend in a corner, but I could feel that these were habits which had lost their intent, and they would disappear in time. It is difficult to convey the full meaning of this experience with Xas. It is subtle, but has profound consequences for how we should approach horse control. We tend to think a lot about the message we want to get across to our horses, and how we can best get it across to them, but how often do we consider the horse's ability to listen and respond? It is easy to assume that a horse is a horse, and within a certain range of sensitivity they will all react in the same way to our message. In fact all horses are not only different in sensitivity, they live in different worlds, with different abilities to respond to us. They don't always have difficulty because they are in pain or because our message is badly presented, sometimes they are just living in a parallel existence. Like children with dyslexia or autism. We don't need to give up on them for this reason, just learn that horse control has a bigger picture, and our communication must include faith and love, as well as intelligence and skill.